An original letter of correspondence between Randall Chase and his uncle, Joshua Coffin Chase. Topics discussed in the letter include a laborer Smith's release from jail after a fight with another laborer's son and allowing Smith to return to work at Isleworth Grove. Original letter from Randall Chase to Joshua Coffin Chase, February 29, 1928: Chase Collection (MS 14), box 49, folder 20.83, Special and Area Studies Collections, George A. Smathers Libraries, University of Florida, Gainesville, Florida. Digital reproduction of original letter from Randall Chase to Joshua Coffin Chase, February 29, 1928. I have read with considerate regret your letter of the 28th regarding releasing Smith from the Orlando jail. The whole trouble is due to the fact that we were not advised in this office that you or any one else had been advised of the situation, or had done anything about it. As you know we have always handled all labor matters and troubles thru here, and when we handled this matter of releasing Smith we were only following the usual and established custom. The information that reached me was not the same that reached you as to the need of Smith. I was informed that Smith has been put in jail for disorderly conduct, and the charge of being drunk, furthermore that on account of his not being on the grove it more or less delayed the installation of the irrigation system which you, and all of us, want to rush to completion as fast as possible. My first thought was identical to yours, to let Smith soak where he was, but on reconsidering I thought it would be to our interest to take him out and continue the work without interruption rather than flunk around with new, or strange, help, or continue at half speed in case we did not find any one else suitable. I assure you that it is not my desire, or even thought, to encourage drinking or disorderly conduct in or about Isleworth, however you know that where ever men are there is going to be a certain amount of that done anyway. The instructions from this office concerning Smith now are that all of his pay, with the exception of what he needs for board and possibly a dollar for cigarettes, is to held back until we are entirely thru with him. We can then pay him off and he can leave the place and spend his money as he sees fit. As stated above the whole trouble was brought about by this office not being informed of what you had already done about the matter. I regret very much that what I did does not meet with your approval and I assure you that I am perfectly willing, and would be glad, to stand for the amount of bail rather than have it go thru on the Isleworth account. Chase, Randall. 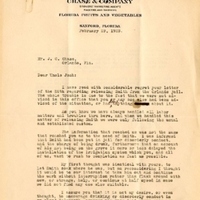 “Letter from Randall Chase to Joshua Coffin Chase (February 29, 1928).” RICHES of Central Florida accessed April 20, 2019, https://richesmi.cah.ucf.edu/omeka/items/show/2767.